Fine lines, skin discolouration and uneven texture can all contribute to the appearance of ageing, tired skin. Lasers are an effective and reliable way to help combat these problems and can be used alone or in combinations with other anti-ageing treatments such as wrinkle smoothing. Laser skin rejuvenation works in two main ways to freshen the appearance of the skin giving it a more youthful and bright appearance. Firstly, the laser stimulates the production of collagen and elastin which contribute to give skin its youthful texture and radiance. Secondly, the laser works to diminish skin discolouration such as thread veins, age spots or redness. Before the treatment, skin is prepped with a mild skin peel which enhances the result of laser skin rejuvenation. A cooling gel is applied to desensitize the skin and help guide the laser. The laser is then directed onto the skin in small sections. Depending on your skin, treatment takes approximately 45 minutes and we recommend a course of 6 sessions spaced 2 to 3 weeks apart. We will suggest an individualised treatment plan for your requirements at your consultation with your specialist practitioner. The treatment is mildly uncomfortable and the laser has been described as feeling like “pin pricks.” You may wish to take analgesia such as paracetamol prior to treatment to minimize any discomfort. Following your treatment, you may notice some redness and swelling for up to 48 hours. Rarely, the skin may be temporarily slightly discoloured and small blisters can appear which will heal in a short time. Any pigmented spots will initially darken before flaking off a short while after treatment. The full effect of the laser rejuvenation is normally shown within 8 -12 weeks as the new collagen and elastin is produced, though some effects will be noticeable immediately after your course of treatment. 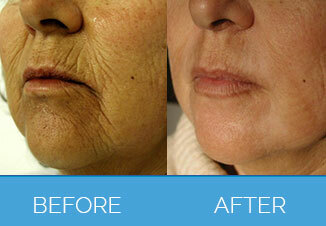 Laser skin rejuvenation will give permanent results, however your skin will continue to age after the treatment. This is very dependent on the condition of your skin prior to treatment. Most clients find that between 4-8 sessions are sufficient. Yes, there are alternative skin rejuvenating treatments, your co-ordinator can help guide you on the best treatments for the results you are trying to achieve. There are no patient stories for Laser Skin Rejuvenation Treatment. Any form of cosmetic enhancement is very personal, so prices are bespoke dependent on your individual needs. As a rough guide, you can expect to pay from £69 onwards.